Inspired by David Kirk’s excellent book “The Mountains of Mourne” and also by Comments in Mountain Views I decided to venture into The Mournes! I chose Slieve Donard at my starting point despite differing views expressed in Mountain Views. I’m glad I read ct_armstrong’s comment of 18/05/03 – “Slieve Donard must not be dismissed!” How right he is! I started at Newcastle and went through Donard Wood, a beautiful place with the Glen River tumbling down cascades to green pools of water. Following the Glen River I eventually arrived at a magnificent glen with Slieve Commedagh on my right and Slieve Donard on my left. What a fabulous setting! 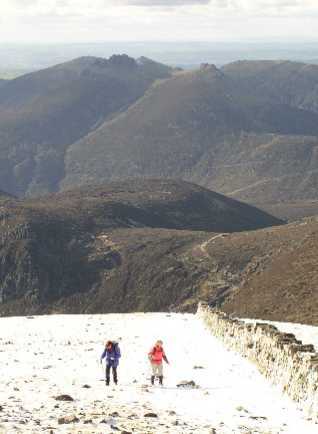 A granite causeway leads up to the Mourne Wall at a col between Sl. Donard and Sl. Commedagh. Some of the granite steps were iced over and care was needed here. When I arrived at this point the views disappeared in a heavy snow shower. I looked over the Mourne Wall into a whiteout! Had I come this far to see nothing? disappear into the white. I met a hardy soul who advised me to wait a few minutes – “It might clear briefly”, he said. Sure enough it did and what views! The Mourne Wall snaked down Slieve Donard and crept up Slieve Commedagh. This great wall is probably the only snake left in Ireland! I peeped over the Mourne Wall again and now the Mournes were revealed in all their glory! Looking across the Annalong Valley were snow covered Binnian, Lamagan, and Cove. The Devil’s Coachroad looked treacherously iced up while Bearnagh and Slievenagloch seemed to invite me on – another day! (Photo). I followed the Mourne Wall and ascended Slieve Commedagh, hurrying now as the snow started again. No views this time as the snow clouds closed in and did not clear. Grateful for its navigational security I followed the wall back to the col and descended carefully to the upper Glen River track. What views, though some were only glimpsed briefly, I will be back!